Yep, it’s Winter in the northern hemisphere. The days are short, the nights are long, and the light is dim. Because of the limited sunlight our opportunities to make Vitamin D are very much reduced – and that’s bad news for our mood. In this article we will explore why low vitamin D bowls us over, and what we can do about it. Why is vitamin D important for good mood? In an nutshell: vitamin D is needed for healthy moods. Vitamin D influences serotonin activity in the brain, and it is responsible for activating certain genes that control the release of neurotransmitters. Serotonin is one of our happy chemicals, and a vitamin D deficiency is associated with low levels of it. 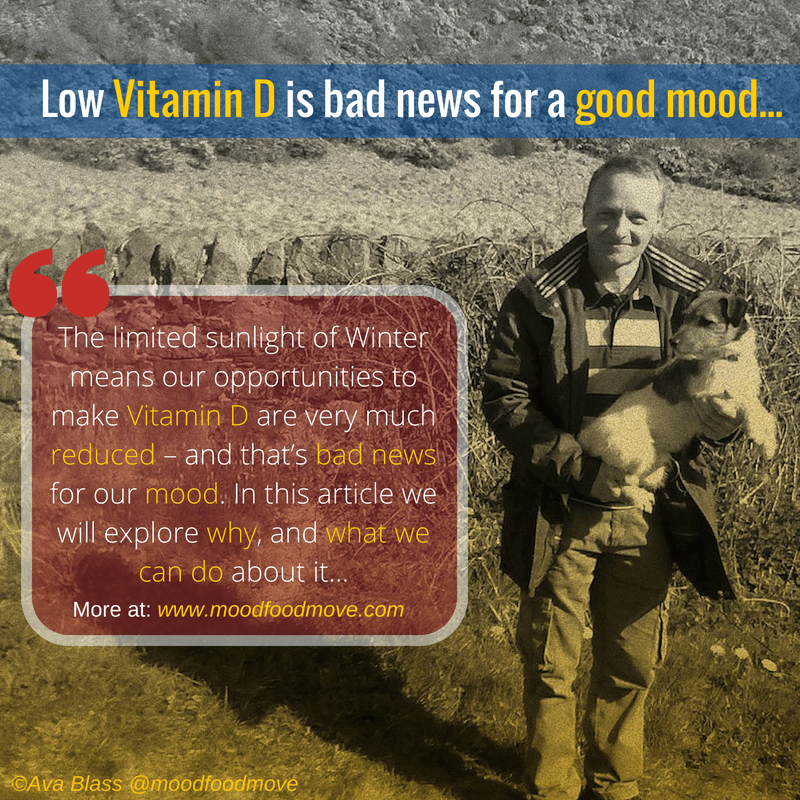 So… low vitamin D equals low serotonin, which equals low mood. It’s therefore of no surprise that medical studies have find low vitamin D levels to be associated with depression. This relationship was strongest among those with a history of depression. 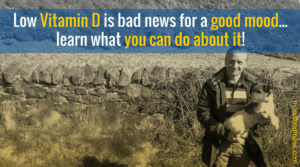 If you have a predisposition to depression then low vitamin D status will impact that. Yes, there are many other co-factors, beside vitamin D, needed for serotonin production – but in this article we’ll just be focusing on vitamin D.
What is your daily vitamin D requirement? Bearing in mind that vitamin D deficiency affects 75% of Americans and is now recognized as a pandemic, you may wish to check whether you have symptoms of low vitamin D. If you suspect a deficiency you can test for yourself via an in-home vitamin D test kit. Testing will indicate if you are 1) vitamin D deficient and need to raise your levels, or 2) in the healthy range and need to maintain them. Vitamin D tests can also be obtained through your doctor. Another option is to manually calculate your daily personal requirement of vitamin D, and how much you are likely to be getting. The amount of vitamin D you need per day is derived from your weight in pounds; then the amount you are already getting from sunlight and food will be subtracted from your daily requirement. It’s easy to do, you’ll find full instructions on the Vitamin D3 website. How can we obtain vitamin D? The two main ways to increase your vitamin D levels are by exposing your bare skin to sunlight and by taking vitamin D3 supplements. They are the best options because it’s becoming widely acknowledged that you can’t get the right amount of vitamin D your body needs from food. Vitamin D is manufactured by our bodies when sunlight directly contacts our bare skin. During the bleak Winter months this is near impossible to achieve. When it’s cold and wet outside we spend more time indoors and cover up warmly when we do venture out. In Winter I make sure to always go for a walk in the middle of the day. On cloudy days the amount of vitamin D I’d generate from sunlight would be pretty much negligible. But on sunny days it’s a small top-up to what I get from my diet and supplements. Besides… exercise boosts serotonin production, as does exposure to daylight – so even on the bleakest days that midday Winter walk genuinely improves my mood! If you’re under the guidance of a doctor they tend to prefer topping up your vitamin D levels via a monthly vitamin D3 injection or a large single dose of oral vitamin D3. 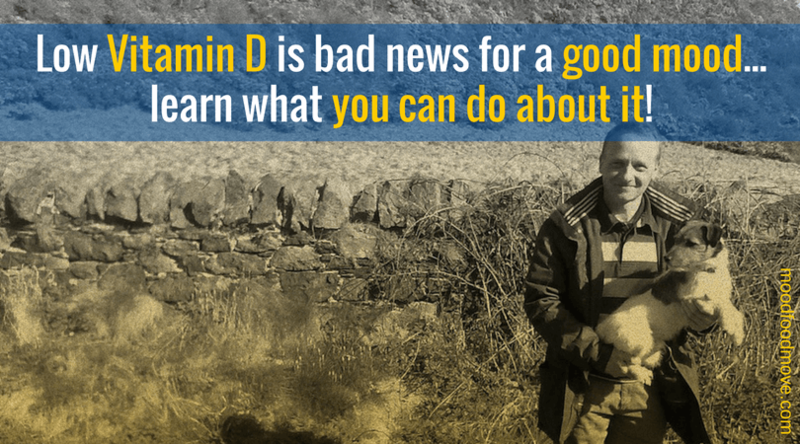 Your doctor may give you vitamin D2, make sure you get vitamin D3. Alternatively over the counter you can get vitamin D3 drops, topical applications, as well as the regular capsules/tablets/softgels. Experiment to see which gives you the best results. In closing, there is another source of vitamin D: food. However very few foods naturally contain vitamin D, and foods that are fortified with vitamin D are often inadequate to satisfy either a child’s or an adult’s vitamin D requirement. But if you want to increase the amounts of vitamin-D-rich foods in your diet here is a list of the Top 10 foods highest foods in vitamin D, and the best vegetarian and vegan food sources of vitamin D.
Let me again reinforce that vitamin D is only one of many co-factors needed for the production of happy chemicals. Low mood does not always indicate that you have low vitamin D levels. Let me know if you are taking vitamin D3, and what your results have been. Recovery is in motion at all times: so, be vigilant!